The Earthrise Repair Shop is an experiment in performance conservation and regeneration founded on ecological principles. Its main purpose is to invent performance environments that will generate fresh perceptions of ecosystems and how they might best be sustained. 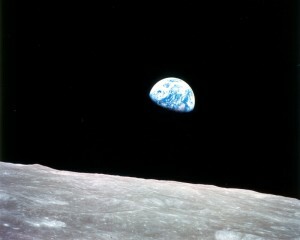 It is named for the photograph of Earth from space taken by the Apollo 8 moon mission of 1968. So, as a Repair Shop, it aims to reach beyond worn-out human ways of refracting, revering and responsibly regenerating and revitalising life on Earth: the essential five Rs of the ERS. The Earthrise Repair Shop project is located in North Devon, England, at a junction between two valleys where two streams meet before flowing on northwards to join the Bristol Channel. 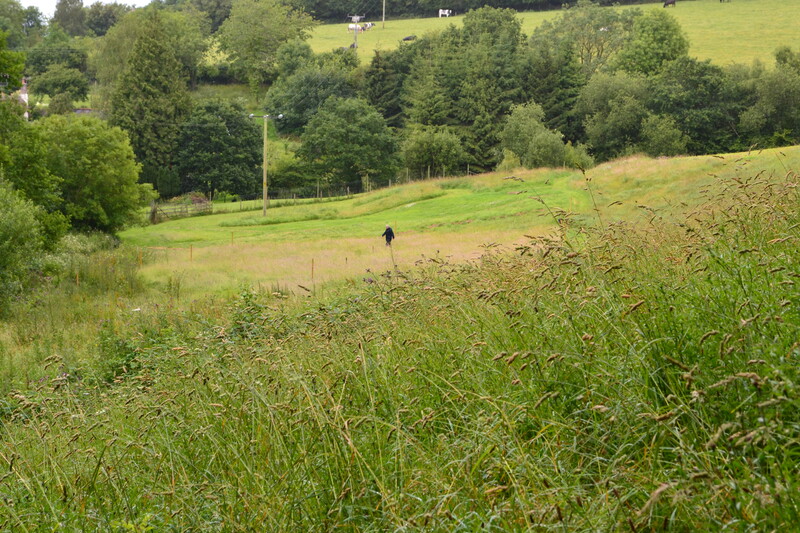 By the side of each stream there are small meadow areas, which had been grazed annually for over twenty years. 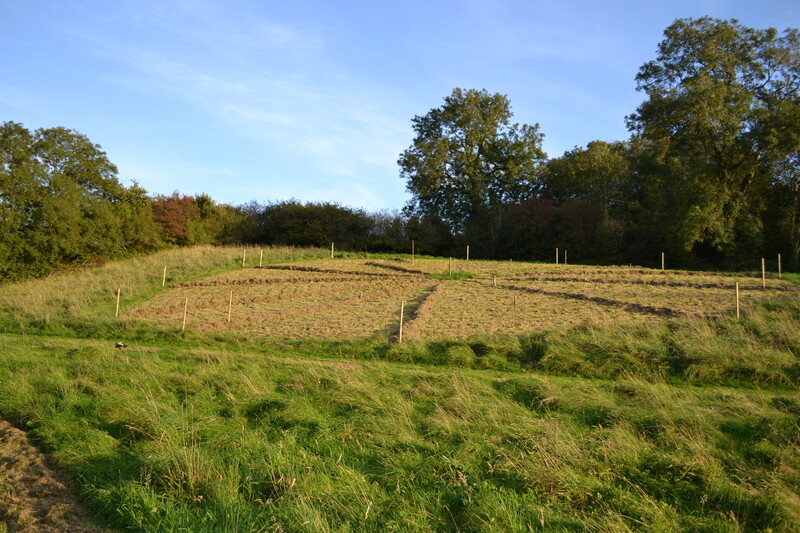 In the past two years (2010-11) the meadows were encouraged to regenerate, and during the summer just past they became home for an increasing diversity of plants and animals. In late May of this year, when its grasses mostly had grown to almost a foot high, a narrow meandering path was slowly trodden into the meadow beside the south-to-north flowing stream. The path was made in the shape of a major ecological feature of the Earth which, if it were outlined to scale on the surface of the globe as pictured in the Earthrise image above, would probably be clearly visible to the naked human eye from the Moon. The path is obvious and easily accessible for all kinds of people, though from ground level its overall pattern is not perceptible. Yet travelling around its never-ending route appears to provide direct experience of perhaps otherwise unreachable qualities and dimensions of an ecological wonder that is wholly integral to life on planet Earth. This potential emerged through a series of visits by several artists, academics and varied other colleagues and friends, who explored the meander between May and September 2011. Yet it is just a simple path or maze or nature trail or environmental puzzle that anyone could enjoy. What is this Earthrise Repair Shop meadow meander? The meadow meander is the first significant Earthrise Repair Shop experiment in encouraging human ‘econnectivity’* to the Earth through performance conservation and regeneration. It partly arose from the work of the Performance Footprint network project, when at the February 2011 site visit to Cove Park its members veered away from ‘global’ ecological concerns by choosing to develop attentiveness to the immediate environment of the hillside overlooking Loch Long. Without doubt this was a necessary shift in the process of making creative performance responses to the natural richness of that amazing place. Yet, besides much else, that shift posed crucial questions about one of the great mantras of environmentalism: Think global, act local. Among those questions is a challenge implicit in performance as a research method, which often refuses the binary theory/practice assumptions that give the mantra its shape. Another related result is caught in a simple but profound conundrum, which poses the problem of how an imagined collapse of the global/local difference might productively open up fresh perspectives on, and perceptions of, Earth’s ecological processes. Embrace becoming global-local/local-global: even – tra la la la – ‘glocal’. The meadow meander at Earthrise Repair Shop became a means of making an embodied engagement with that conundrum. 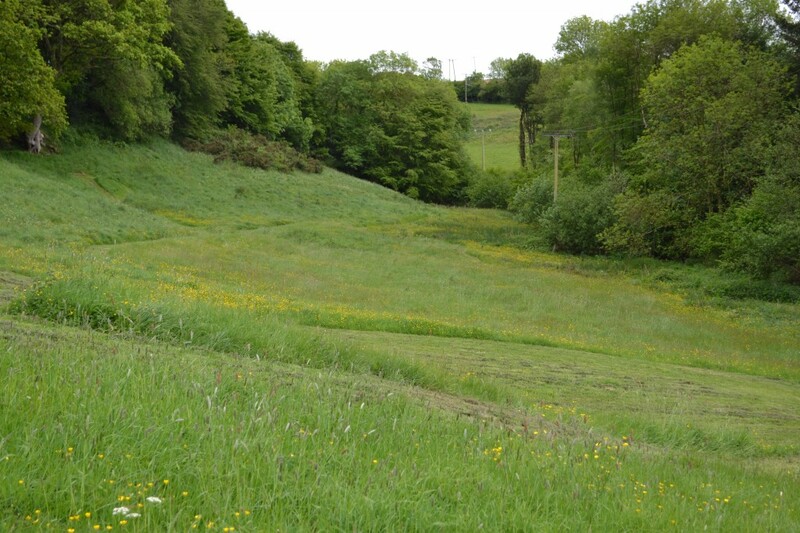 Meadow meander – brief rationale plus a methodological key. Performance can be integral to that process in becoming a shape-shifter of perception. Through refashioning perceptual habits it can help revitalise ecologies in decline. One critical way in which the network project realised this potential was by evoking one environment through another as it shifted between its four main sites of investigation: from Fountains Abbey in the Yorkshire Dales, through Cove Park above Loch Long in Scotland and the City of London by the Thames, to Bristol Eastville on the River Frome. Encountering and re-encountering each environment through echoes of the others produced transformations in perceptions of their ecologies. The underlying performance principle of that sequencing is another simple yet potentially profound method for environmental conservation and regeneration: creatively evoke one environment through another to destabilise restrictive habits of reception and open up fresh channels of perception. The meadow meander in practice. A third way in which the network project significantly helped to evolve the Earthrise Repair Shop experiment was through visits from two of its members at the height of last summer: Phil Smith, in July, and Paula Kramer, in August. Other visiting colleagues and friends included environmental movement artist, therapist and researcher Sandra Reeve and theatre maker/performer, researcher, teacher and author Bim Mason, who is also founder and artistic director of the Bristol-based circus and theatre academy, Circomedia . In all, over fifteen people used the meander and most gave substantial feedback on its affects/effects, mainly through informal conversations that tended to traverse fluidly through a plethora of associations, ideas and topics. What follows here are four written responses to the meander experience. The first and last from Paula Kramer, the second a brief account of Bim Mason’s visit drafted by Baz Kershaw and approved by Bim, and the third from Phil Smith. It is salient to note that at no point did each of them see the others’ responses, so reading this was their first chance to ‘compare notes’. Also their contributions are unedited except in one detail, as all references to what the meander represented have been redacted (indicated by XXXXXXX below). Of course a few clues remain as to the originating feature that shaped the meander, but readers still might choose to ignore those and create homologies between your reading processes and the experiences evoked through the writing. As already noted, at ground level the meander’s overall shape was not discernible. So before entering the never-ending path, most visitors were asked whether or not they wanted to know upon which of Earth’s ecological features its shape was based. A clear majority decided they didn’t want to know, or started on the path before the question was posed. Subsequently what it represented was always revealed either as part of the feedback conversations, or sometimes before that began by inviting the visitor to gain a bird’s eye view of the meadow from up in the branches of an old oak tree high on the side of the north-south valley. 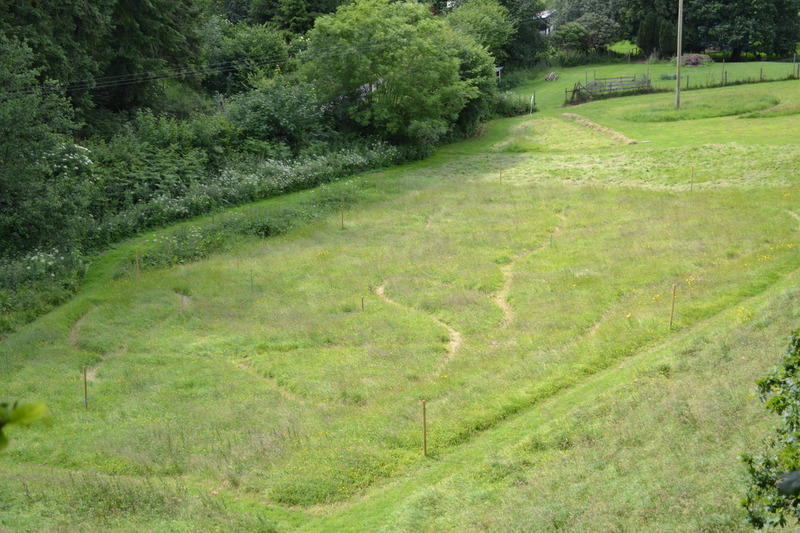 Another reason for withholding this information here is that the meadow meander – all being well – will be recreated during next spring, when the experiment will continue with plans to augment it though the addition of another version of the path on the east-west valley hillside of the Earthrise Repair Shop. Four responses to the meadow meander in practice. many small incidents encounters conversations moments. from knowing hardly anything (there is a meandering path. there is a meadow. baz lives there. he’s doing something there. he doesn’t quite let on what it is.) to spending time there together – moving, walking, talking, eating, sleeping, moving. my face against soft grass your hand against earth my hand against earth making way. your hand holds a lacy leaf. I adapt to your thorns let’s meet on equal footing let’s meet at all. we sit in the sun and under a roof ice cream, berries, wine, tea rainbow vegetables fruit salad. an hour is an hour is an hour we always meet. I sit there for a while. and turn my head. there you are your hands entangled in blue string. the light throws itself on you in fabulous brilliance you lift one leg. it’s afloat where is the substance? the warm and cold streams floating up and down the hills where two valleys meet. the whole world in one back yard. Bim visits today. 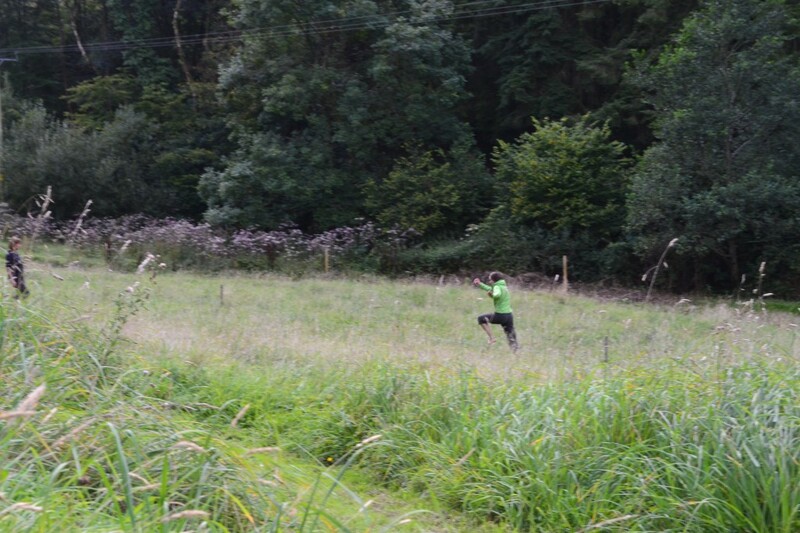 The first ‘outsider’ to use the Earthrise Repair Shop meadow meander. He seems into it immediately – maybe booted up by the brief description and photo of the grid from high in the quarry oak tree that Baz sent him yesterday. He walks the XXXXXXXX with Baz trailing him a couple of circuits, then Baz sits and watches as he finds his way round a couple more times, stopping for a brief chat after each circuit. He’d tried to work out where the XXXXXXXXXXXXXX were but quickly gave up; on his circuits alone he talked about the curves and sense of flying (a bird swooping migration around the Earth? ), about the steep turns and feelings of being pushed and pulled along as he travelled the route. He wanted to run it and set off at pace, leaping over the XXXXXXX as if in a race. 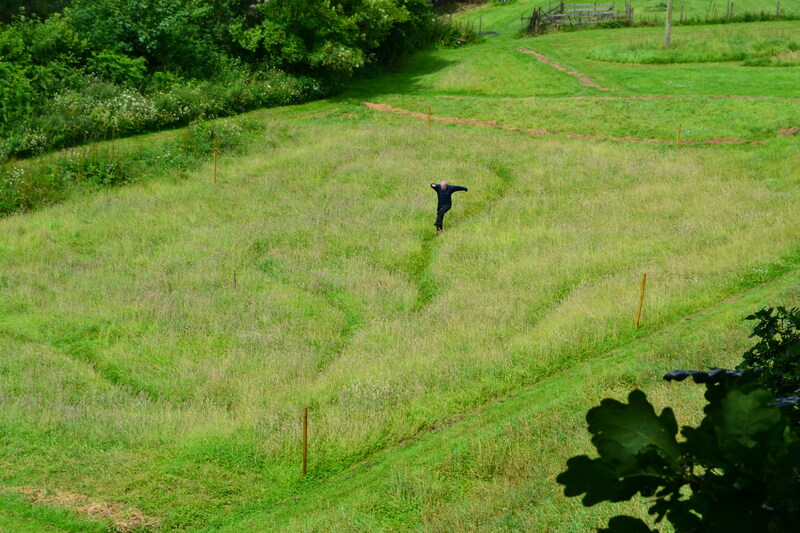 Baz talked about tensions between grid-maps and XXXXXXXXXX, the closed system of the meadow meander’s continuous XXXXXX created by abstracting the circular XXXXXXXX around XXXXXXXXX that, if reproduced, would add dead ends and false starts to the path. Bim seemed to gain a sense of immersion, talking about the enormous energies of the XXXXXXXXX system, wanting to experiment with the forces it produced in his body. He recalled training with legendary French movement artist Jacques Lecoq, who described how architecture produced the shaping forces of buildings so that bodies respond to their pressures… but the meander was different because rooted in the natural environment with energies that are huge compared to almost anything humans create/devise. Two ideas in particular stick: Bim said he’d like to translate the experience of doing the meander into a movement routine/dance; Baz recalled last year’s raking of the meadow areas and tai chi impulses that trailed in its wake (a raking wake?). Bim looked at the XXXXXXXXXX outline diagram for the first time, and immediately started demonstrating what it might produce as a movement score. Baz mentioned the illusion of flatness in both the grid diagram/drawing and meadow cut path: the XXXXXXX actually rise and fall between the XXXXXXXXXXXXXXXX as they flow between XXXXXXXXXXX, and Bim imagined a XXXXXXXXXXXXXX roller-coaster ride. Baz suggested a children’s runway as substitute rollercoaster, a gravity defying wall-of-life (contra -death) where running up and down slopes and around curves replaces machinic fairground inventions. Climbing the ladder into the branches of the oak that clings at the edge of the hillside quarry, they looked down on the grid as suddenly the grass was caught by the valleys’ air currents, swaying in complex patterns around and across and through the meadow meander, like a flowing overlay of XXXXXXXXXXXXXXXXX energies: this being not just a metaphor but also a microclimate reality that reflects and effects the field in both pattern and principle; a global performance ecology refracted through the local as the same forces/energies are at play in both because they are integral to each other, enfolded-in through myriad feedback loops that ensure the specific environment of the two valleys is always already a part of the wider ecosystems it is responding to. And they discussed bird flight – particularly the swallows’ soaring above – and airflows, noting that their swooping patterns refracted how the two valleys’ different atmospheres converge where the two streams meet. (It later emerged that part of the birdy spectacle they watched happening over the cottage was caused by a sparrow hawk attack on the small flock of swallows, a ‘horrid’ close-up for Gill at the same moment as they were enjoying the birdy-atmosphere synergies.) Bim suggested it would be good to a get more specific sense of the microclimate airflow patterns, reminding Baz of Welfare State International’s outdoor aesthetic of long bamboo poles and pennants, strategically placed to frame their performance sites. An idea roundly queried by Gill for its likely messages to the neighbours and passing trade. Later Bim and Baz scythed the long grass outside the northern edge of the grid together, leaving a 12-inch high swathe that later led to letting the meadow grow though the summer so that the meandering path XXXXXXXX became a semi-permanent installation. 1/ Pondering what a performance reflecting on environmental change might be, it became difficult not to abandon the [walking] task in order to reflect on environmental change, as if the latter were necessary for the former. This may be a trap. 2/ That reflections are less distinct in experimental science than in popular science publishing, let alone those narratives of environmental change that surface in both ‘serious’ and clownish or abject mass media. 2/ For dramaturgical rather than empirical reasons, it is hard to believe (feel entertained or intellectually satisfied by) the narrative of the Good Earth (sub-plot: wicked humans). Even the most heartfelt and well-researched accounts of “pollution” read too much like laws of ritual purity. A spiritual or ideal cleanliness is an organic death. 2a/ Is there a kind of doubleness in the theatre of “green”? – that the Earth is good but that we should fear its anger at what we do; that the Earth will wipe-us-out. So the Earth is called “good”, but described as though it is what is otherwise called “evil” – a terrain of voiceless, unreflexive danger? 3/ If human consciousness is part of Nature, and technology, its objects and intentions, are parts of Nature (so much so that the word “part” becomes suspicious – as if it might have the same relation to Nature as a partial object to an individuation), suspension bridges and the skeletal structures of large plant-eating dinosaurs are made to the same pattern, are responses to the same physical forces. “The mathematics are out there” (Roger Penrose). 4/ It is (memetically) tempting to believe that ideas and images prosper and propagate in ways not dissimilar to biological information. 5/ Any ‘reflection’ will take place on a contorted and contorting ‘surface’, or rather on a series of contorting reflective surfaces weaving in and around each other while moving also in relation to the motions of changes in/being the environment. 6/ Empirical science is telling us that it is between very probable and a cast iron certainty that human actions have triggered an ongoing and accelerating warming of the planet, and that we cannot be certain what the consequences will be, but that we would be foolish to assume that the changes will be comfortable (or even life-sustaining) for much organic life on Earth. 6/ Apocalypse is a socially attractive fiction: like utopia it implies a bounded space (rather than city wall or island shores, apocalypse is bounded by isolation and the eradication of complexity). It allows everyone to play – if the game is feral survival – to drop the usual rules, it brings the cancellation of all rents, debts, appointments. A vicious holiday. The illusion of starting from scratch (following Jesus, Thoreau and Breton – abandoning communality to take a walk.) Despite these qualities, the narrative of apocalypse has become an assumed part of popular reflecting on environmental change. It is the something that the “we” (when this fiction of an aggregation of individual consumers forms an audience, assembled in the absence of “good taste”) secretly or not so secretly want: not surprisingly, as the narrative is constructed for the “we” to want it (and has survived by appearing to be constructed for, even by, us). It is the contemporary sublime, this time written by the landscape gazing mutely back. 6/ In Global Catastrophes, the vulcanologist Bill McGuire’s most credible narratives for a Sixth Mass Extinction are all “natural”. Human behaviour, more than it “damages” a planet separate from itself, makes itself vulnerable to a recidivist planet that has repeatedly generated “catastrophes”. And what if the planet “wants” this? In the same way that an aggregated and rough audience “wants” apocalypse? Does the planetus (the planet including us) have a memetics? 6/ We are now a geological force. 6/ A child sneaked in at the back of a recent screening of The Cove and watched with care as the nets of the fishermen herded the dolphins towards the thickening shallows; she saw the delegates from landlocked and impoverished nations smiling, she saw Sea Worlds that reminded her of the refugee camps, she saw the educational murals, she saw the tins of chemical tuna in the coolers, and she remembered the old old story that they were always making up in the camps and playgrounds; about how the instructions for people and machines are not written by good people choosing good things, but how they come from a spectre that no one ever quite sees, who is everyone and who no one is like, who no one has chosen and who commands almost complete consent and who hurts everyone even though it owes everything to them, and that it is this very debt that determines everything everyone does, from the direction of the cars to the colour for stop and the colour for go, and that no one who walks on two feet and wears a hat, a belt or a kimono can escape it. Running from the cinema, the child out-stripped the angry charity worker, pausing at the traffic island, hauling on the fumes and the smell of street food. She ran her own movie, an anime, of the flow of the cars that was the flow of the XXXXX, and of the cruelty of the fishermen’s knives that was the strike of a fish’s jaws; and everything that her human character did was seized on by artists and transformed; highways into the trails of slugs, plans into deserts, blueprints into reflections on the surface of a pond, and wounds into new organs. 6/ “Never set foot in a fallout shelter”, Mutant advised in the 1960s, for “it is better to die standing with all the cultural heritage of humanity, the perpetual modification of which must remain our task.” “Nuclear weaponry’s main function is to deter not the enemy but the state’s own population. Contrary to the Ban the Bomb movement, this position sees not nuclear annihilation as the main threat, but the disarming of critique… One wonders how much the twenty-first century’s obsessions with things environmental might likewise play a demobilizing role.” (McKenzie Wark, The Beach Beneath The Street) Over and above the author’s political opinions here, what if stories are inadequate (asks the storyteller)? What if the storytellers are inadequate (asks the stories)? What if the vocabulary has been grinding the words down to letters again (vdesc w2.%st sdv^7=sst b3s)? After Steve had kindly posted on the blog some notes of mine under the heading “Footnotes for Apocalypse”, I received an email from Baz, inviting me to visit him at his cottage. I can’t recall the exact wording, but he wanted me to see a meeting point of what passes for heaven and hell in the contemporary world that had opened up on his land. I hope I do not misrepresent him when I say that his reasons for inviting me were partly practical (to test the opening – I think 5 people had previously tried it out), partly his partial identification with something in the “despair” of the Footnotes, and partly a pastoral care for my own wellbeing. These partlies all took on the qualities of partial objects – voices without bodies, shapes without substance, maps without mass. All of which were to coalesce in the complex, but organic and topological opening, a kind of intestine, which I now have as a part of my body and out of my control. Baz said nothing more by way of explaining the heaven/hell site. We arranged a date and then brought it forward ten days: the “meadow” had abruptly come to a good moment for me to visit. I caught the train a day later. An hour having passed along the flat valley floor, and I was met by Baz at the station and was at the meadow shortly after that. Baz’s cottage sits at the meeting point of two valleys, each with its own stream. The streams meet close to the road, a former drovers’ route from XXXXXXXXXXX to XXXXXXXXXXX, and one runs alongside it. Adjacent to the cottage are areas of garden, a pond, a fenced area for chickens and a large meadow, divided in various ways, and a small strip of woodland in which a tiny quarry is shaded. The land is overlooked and protected on one side by a wall of large, mature conifers that are due for felling: a kind of threat, at present mitigated by a [neighbour’s] private inertia. An occasional vehicle passes by on the old drovers’ route. 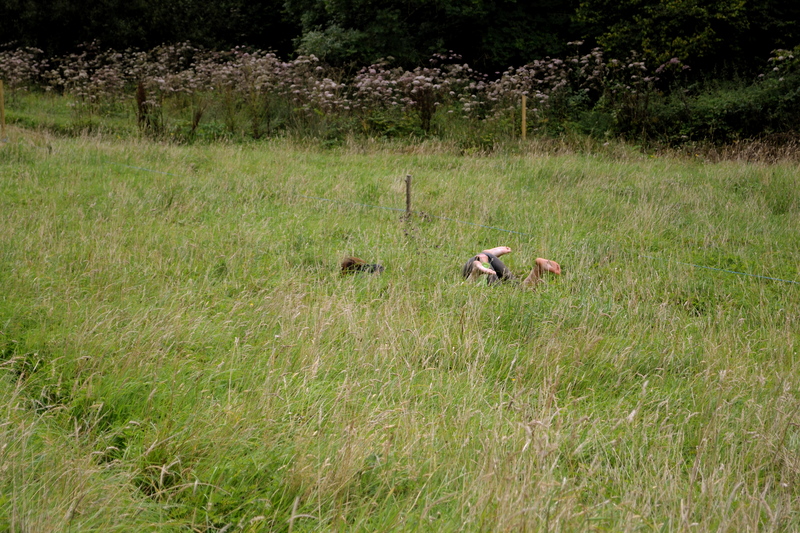 The heaven/hell confluence is a figuring of XXXXXXXXX “mapped” onto (trodden into) the meadow. I walk this “maze” for a while guessing what it might be (first guess: fish) and then Baz lets me in on it. 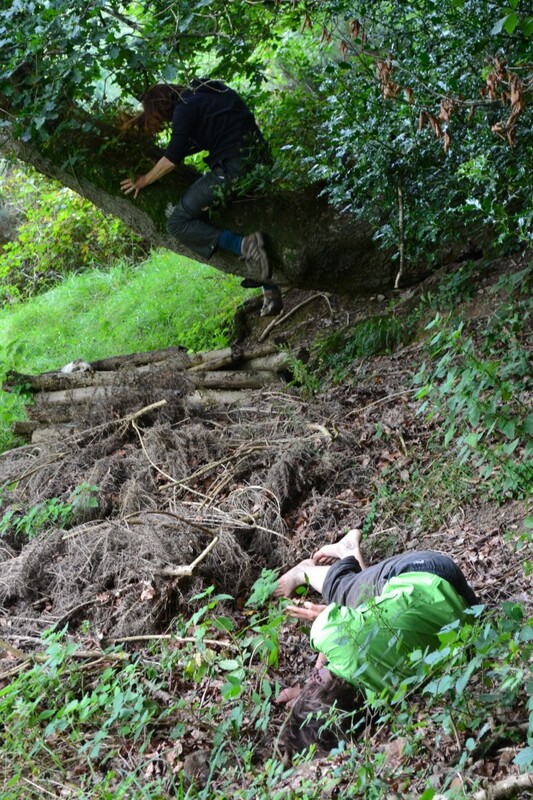 I walk it some more, climb up a long ladder leaned against a tree growing from the edge of the tiny quarry to photograph the XXXXXXXXX chart from above. Although it is on a slope the outline cannot be seen clearly from anywhere on the rising ground. We go inside for a cup of coffee. Talk about what it is, this meadow chart, how it might be used. About apocalypse and its narratives and the role of cottages in them. A woodpecker feeds on the bird table. Then we come outside once more and I walk and run the XXXXXXX for, say, 12 or so circuits. I have very little idea how long it takes – 5 minutes? An hour? The gut stretches. Pushing things around in peristaltic waves. I began by walking the XXXXXXXXXXX at an even, brisk pace. Very quickly I was able to look around and began to notice rather large features that I had previously ignored: I was amazed to notice that there were power-lines hung across the meadow on tall poles. Through trees I glimpsed a building on a far horizon… it rained, the sun shone, the butterflies (meadow brown and cabbage white) retreated and reappeared according to the light, I trampled the grass that had been trampled, I followed the lie of the stalks as Baz suggested; what had seemed enigmatic became a simple spectral XXXXXXXXX down which I floated. 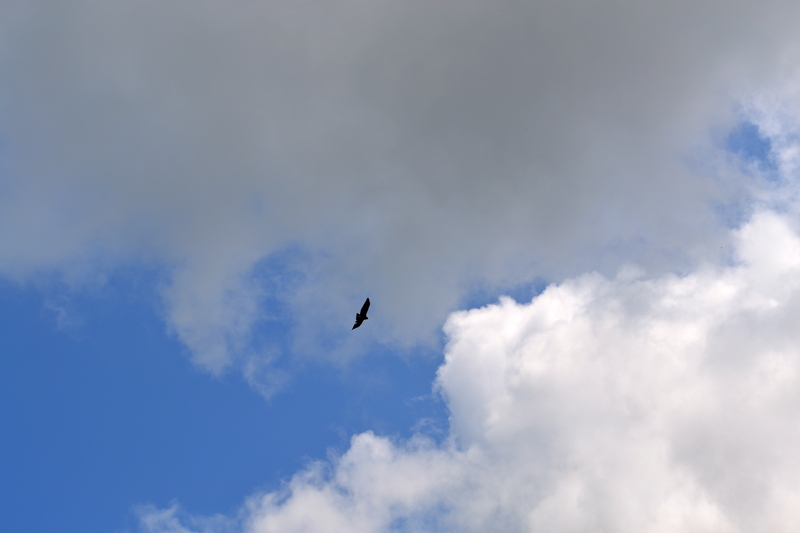 Only when I attempted to follow the circling of a buzzard while walking very slowly did I become giddy and stumbled. At one point, in response to the dip of the ground, my skeletal frame crunched, then realigned itself into a more “satz”-like state of preparedness. I wondered why neither Baz nor I had mentioned to each other the XXXXXXX that stretched across the middle of the “map”, a kind of XXXXXXXX, necessitating a step or leap when moving from one XXXXXXXX to another. I think now of the initiations of young XXXXXXXXX and the impersonation of the XXXXXX. At times the path began to disappear and the meadow became a woozy mass of appearance, through which muscle memory guided me precisely. Whether by pigment or scintillation, the tops of the grasses appeared misty. We were going round in XXXXXX. And now that I am away from the XXXXXXXXX and trying to write about them, there is a swirl of desperation. I sit and stop, but the stiller I get, the tighter the vortex becomes. It has a life of its own, this desperation – a ghost sheriff emerging from the history of small company towns, a fleet of possessed tanks rolling down the streets of wooden shacks, a matrix of barbed wire pulling the countryside tighter and tighter – its personifications are utterly unhelpful, truly and unusually without meaning or allusion: the more I sit here the more they pass uselessly by on those looping XXXXXXXXXX. An accursed share. Refreshing the memory; unfathomable, mute. Two days before my walk in the maze, I had stood on the very point of Dawlish Warren, a long spit of sand dune, where the plastic containers and fish skeletons are bleached white by sun and salt. Talking with a sculptor about her trodden path made in a wood near Darmstadt, walked and scuffed into the shape of a wolf, at the cost of a pair of boots and it had been all about meanings in the rip and pull and counter-current, the forces of the river meeting the forces of the incoming tide, forming the kinds of uzumaki that transform communities in a few moments. How complacent that seems now. The maze “empties” the mind – by shaking the brain it opens up coagulated gaps, rendering them vulnerable to an outside that rushes in to fill the tiny sucking vacuums. The maze strips and rips the shape from the experience, hurls meanings to the beside, by the centripetal force of the whirl of the meadow-XXXXXXXX, by its performance-likeness, by its flat globalisation of a place with the footprint of a large cottage, its conceptualisation and its projection; these XXXXXXX, unlike the deadly (to human and dunes) ones at the Warren, refuse to be employed for anything, avoid signing up to convictions, are on no payroll, do no work and are not rebellious. They plough on without decision, enigmatic – as if behind a faceless face things are gathering towards a spasm that never comes. Relax. Don’t do it. On the way to lunch at the nearest village pub we pass through an enormous market square and by a huge parish church: Baz’s cottage sits within a nexus of routes and staging posts that have been of great commercial, transportational and religious importance. Baz’s XXXXXXXXXX meadow-maze connects to the flows of this greater (if now creaky) machine, slipping its gears, uncomfortable, revving its frame in surges of energy that fail to grip onto the shafts, whirring as if it might throw something off, suddenly, unplanned. Baz describes rising sea levels that might bring the water close by, but not as far as the cottage. Cottages (and farmhouses) are sites for apocalypse narratives: 28 Weeks Later, Night of The Living Dead, The Happening, Dead Snow, Weekend, War of the Worlds, Tripods … they are foolish retreats to the domestic and the (slightly) extended or reconstructed family. They quickly become places of siege and once this happens the narrative generally runs out of steam – most sustained apocalyptic narratives are those in which new kinds of communities are established (The Changes with its neo-village including processional Sikh metalworkers, The Stand with its proto-societies of good and evil, The Walking Dead with its shifting mobile community détourning prisons). The Road is an interesting exception – its journey and its text barely pause long enough for anywhere to matter. The “apocalypse” Baz and I discuss is the possible warming of the planet – which the XXXXXXXXX will partly motor – the increasingly inhospitableness of parts of Africa and southern Europe and the mass migration north of people in search of a habitable climate. The drovers’ route might become a route for crowds of people seeking the temperate. What rituals, what welcoming ceremonies, what performances of introduction could be devised to greet them? What part in that could a place “to the side of”, “beside” the route play? Now, where does the task of advocacy for “flood defences” fit in to this – what if we welcome the new flows of water, people, many-spotted ladybirds, forests of Himalayan Balsam along the rivers, Rhododendron stretching across Dartmoor, the spectre of agricultural communism. Not defences, but routes, flows. Margaret Killjoy’s article in Dodgem Logic advocates establishing a communal permaculture as a response to the prospect of environmental change, deploying a very specific, communal, performative reflection – interweaving the use of voids and derelict sites as guerrilla allotments with an informal social agreement – but what if we build into that the necessity for developing forms and sites of ritual for the welcome and sustenance of those fleeing the heat? They will not be aggressive nomads. But they will transform the social relations of production in the English countryside – cheap labour in an authoritarian, segregated countryside? A return to manual labour? Socialised and common ownership? Pockets of anomaly? Would the meadow-machine (as part of a larger complex of public and private property) be an effective ritual space for meetings of socially reparative, pre-apocalyptic groups, preparing their local permacultures within and in resistance to the narrative of catastrophe, to the side of, beside the route of migration, on a map of XXXXXXX? 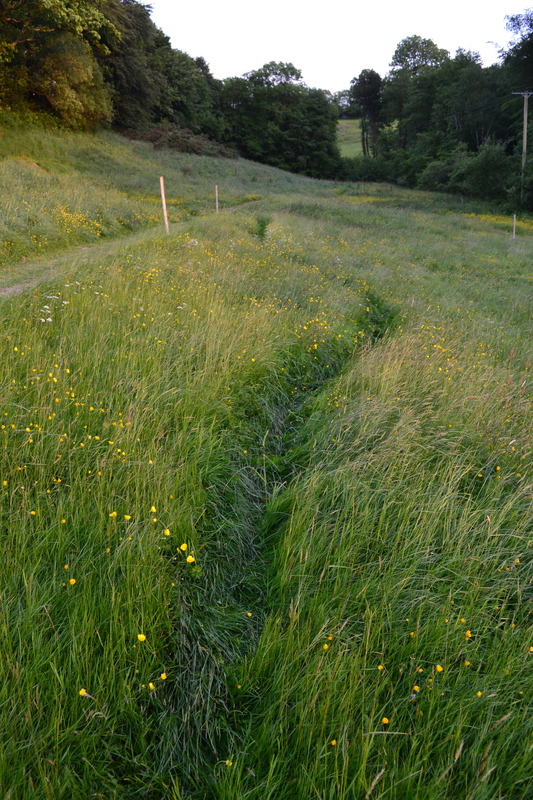 We can begin the testing now – what happens if 39 people arrive to walk the meadow chart of XXXXXXXXXXXX? What would happen if they re-ran our Environment Agency task, but as an advocacy not of defences, but of integrated social, human, water, narrative, cultural and performance flows? you ask me about my experience of “actually being in/using the meander” which makes me wonder why I have not included more about it in my first writing. I think it’s something to do with ambivalence. All that I write now may not be for direct quotation in the blog, it’s more very direct thinking and me talking-monologizing(? )-writing to you and I’m not sure I’m a good formulator (thought-former) just now. And I do want to get this out to you today, unpolished as it is. But maybe there’s a line of thought in here that you find useful. And if it turns out quote worthy after all, go for it. One thing that I still wonder about is the co-existence of the ‘meander’ and ‘the real world’ in your back yard. I’m fascinated by this double-ness and also a bit torn in what I might make of this. I’m such a fan of the materiality that is actually there that I have a bit of a struggle with the idea that there is the XXXXXXXXXX in your back yard. At the same time I think it’s great. Amazingly-real-and-un-real. So I first spent my time where the compost heap will go. Then in the pile of hay. Then in the thorns of the blackberries. Then in the quarry. The quarry. The quarry. The quarry. Then there was this ‘other thing’ that I didn’t know what it was. Something ‘made’. I loved the entry and exit points. I remember a motorway feeling. Running-rushing, gushing, around and around and around. I understand why you have called it a roller-coaster. There are slopes involved. I’m also walking-crawling very delicately and slow. The wonderful feeling that it’s impossible to get lost. The infinite following along. There is some stillness, but the sense of movement, moving-along is stronger in my memory now. And the way the grass is more lying here and more standing there. I think of Prapto here and how he spoke about ‘the lying moon and the standing moon’ during ‘The Ecological Body’ workshop he co-taught with Sandra Reeve in April 2011. [see Reeve website] He was referring to the half-moon as seen in Java and as seen in Europe. You have lying grass and standing grass in your meadow. There’s also a sense of fragility of the whole thing. A sense that it needs care. And at the same time I have the urge not to follow the path, to make new ones, to destroy it all, to play in the meadow as a meadow disregarding the path-making that has been going on. I don’t do this, but I’m tempted to trespass, to burst the boundaries. Then there is this trip-rope, jump-rope. Jump-over-crawl-under-rope. The blue XXXXX. That this is the XXXXXXXX is immediately clear. It was Sandra I think who said that she had a sense of more speed around the XXXXXXXXX. I have a sense of speed on all the XXXXXXXX roads. Later we know we’re in the XXXXXXXXXXXX. In these two images I’m in a joyful XXXXXX fountain/XXXXXXX breathing mode. Maybe we look like some oversized human-animal. That’s what it felt like. Somehow two animal-bodies coming together, half-human-half-XXXXXXX, half-one-half-two, half-playing-half-serious. We’re in the XXXXXXXX, we’re in the grass. I later wish we had spent all our time in the meander. I’m somehow in awe that it’s such a thought through ‘thing’ and feel like I have not given it all my attention because I was so interested in and diverted by corrugated metal, the hay, the thorns, the quarry slope. What is real? What is really there? How much time does imagination need to go through the body? What would it be like to be in the meander when there’s a lot of snow? When there is actually XXXXXX? Why am I so stoic about the real, is this narrow imagination? I sometimes feel brutally attached to the ‘real’. Don’t want no XXXXXX in the grass, want to eat the grass that’s there. And I remain fascinated and drawn to further exploration of this meander. There is a place where I can find all the XXXXXXXXX to explore. Fit to my size. And there’s someone who maintains and guards their presence in the grass. Who insists for the time being that some of the grass is lying and some of the grass is standing. Who cares for the pathways now and some day will let them go again. And then there are maps on paper, XXXXXXXXX in miniature size. It is a very different thing to walk these pathways having seen the maps. I’m not really sure how exactly. It’s somehow about having seen the whole thing from above, which is impossible whilst I’m inside the meadow-meander. I can still remember the black arrows on white paper quite clearly now, intertwined lying eights. When I think of the meander now I think of long green rough-soft grass under my feet, something more in detail, more close-up. One thing I have physically understood is that all these XXXXXXX ways are connected. One body of XXXXXXX. This information has entered my body, even if the time was short that I spent in the meander knowing I’m in the XXXXXXXX. Thank you so much for this, as it is really *extremely* helpful to have such a direct and honest and crisp response. Lovely … for a lot of things that are in there which I’ll leave till later. But for now I will say the amazingly varied embodied ambivalences you discovered in the path are crucial to its effects as it is indeed a space of tensions, contradictions and paradoxes. As you say, the path is a meander and a roller coaster, it carries a sense of safety at the same time as being a kind of trap, the flow encourages movement that goes with it but also desires to break away from it, even to destroy it, and more. All this is crucial to its productive qualities as a kind of … hmm … material-embodied synecdoche of major ecological processes of Earth, and not just of the XXXXXXXXXXXXXXXXX. If this seems like a fair summary, getting towards an accurate general description of a simple meandering path, then what might its purposes become for future users in relation, say, to climate change? These are first ruminations that your writing has sparked, Paula, and yet it quite closely matches and complements and also significantly stretches some of the ways others have written/spoken about the experience of the path. And I am quietly excited that its quotient of predictable unpredictability seems in some way to be a constant in its affects/effects. And you have suggested another dimension in the link between grasses and moons, as the gravitation of the latter and the rises and falls of the former may not be so far away from each other as they usually seem to be. And as well between grasses and XXXXXX direct, of being in and looking over, of becoming immersed and engaging from above at the same time. And of being human and animal in the same moment. And XXXXXXXXX in no more than just two pages and two images. Thank you, with profound gratitude, Paula, for such a splendid gift. Future meanderings at Earthrise Repair Shop. The meadow meander is now gone, outgrown by its own materials, its own setting becoming its undoing … and the field now is hunkering down as the trees have turned autumnal and winter rises to meet the pale sun’s daily fall. It was just a path trodden gently into the grass. A mildly rejuvenated pasture readied for spiders, butterflies and uncountable other organisms. A simple stroll for to while away the silky and/or sulky summertime … tra la la la. Making all the year’s talk of apocalypse seem far, far away. But just around the corner – on the other side of the low, sloping ridge where the two valleys meet – a scythed circle waits for another year to come, and what could be yet another endless path. Perhaps going nowhere fast? Or hastening slowly . . . toward more sustainable futures? Meanwhile, on one of the higher posts marking the grid of maybe the next meander, now and again a young buzzard perches, slowly surveying its place in space as if indeed there might be no tomorrow. Many sincerest thanks are due to all who contributed to the making of the Earthrise Repair Shop meadow meander. Particularly to Steve Bottoms and all the Performance Footprint network members and guests. But also especially and heartily, of course, to Paula Kramer, Bim Mason and Phil Smith for so generously responding and allowing me to include their reflections here. And as well to all the other friends and colleagues – including the yoof (you know who you are) – who visited Earthrise Repair Shop to travel or view the meander and participate in its evolution. Lastly an utterly essential and huge thank you to Dr Gill Hadley, who as my chief collaborator brought edgy scepticism, serious judgement, and supple insights that were effective beyond all measure. Becoming essential to the whole slow endeavour of founding the Earthrise Repair Shop. * ‘econnectivity’ is a term coined by Baz Kershaw in reflecting on the nature of the meadow meander described above. Its first use was in a statement (23.10.2011) in support of Performance Footprint’s preparation of a bid for continuation of the network’s research. ** “Dancing with monkeys? On performance commons and scientific experiments”, in Readings in Performance and Ecology, eds Wendy Arons and Theresa May, Basingstoke: Palgrave MacMillan, forthcoming 2012.
he shat to fertilise it. The grass fed the horse the horse fed the grass. and was burning the useless clippings. Sorry for delay, but I’ve just caught up with this – hopefully ironic – poem-comment, for which many thanks. Earlier on the blog you rightly questioned our hosting of a few bullocks for a few weeks on our little patch of land. Matters have moved on since then at the lazy pace of this lovely countryside. But still we haven’t got a ‘lawn roller’, though coincidentally I have been thinking of getting a bigger one for use on the field as it would help further regenerate the meadow areas. But as – for the time being – I’d have to tow it behind the (very) small tractor/mower used to encourage diversity in the land and keep it accessible, it would seem the ERS is falling short of your ideals. It’s taken two years to begin even marginally understanding the ERS microclimate, and – having decided early on against a cat in favour of wild birds – we’re just on the verge of bringing in domestic/farm animals to complement the species of wild critters that seem to have appeared in growing numbers since we’ve been here. Maybe one day there’ll be a horse, but it would have to be a small one given the size of our patch. So likely we’d have to borrow a dray from a neighbour (there are a few about, alongside the bullocks) if we wish to roller, mow and till to properly meet your delightful vision of an ideal bucolic scene. Well I arrived at your ‘meadow meander’ this evening out of breath, having lost my way a bit between the 1960’s brutalist-concrete buildings of Leeds University, and out of body too, full of front brain activity and food and all the previous things, the click of doors and plastic passes, the pedestrian crossing and my PCI18 conference bag and the book full of all the things I could, should, did didn’t go to. You know my mind was full of mutterings when I entered the hidden gap between the buildings to the cemetery where the meadow was. On getting closer, I could see a blue cordon off rope glaring against the grey sky and a wild space contained within by the grass mown all around. It seemed small and rather hemmed in by the rest of the place, but I knew from a friend of the thought and effort in growing it and had seen the broken red striped tape broken, wafting in the wind some months back, and knew of the challenge. I knew nothing though about you and this work, of what I should do. I was coming at it completely fresh but still with a large dose of mental noise. On entering, I felt an urge to step lightly on the ground but as I became one of many who trampled and flattening underfoot – these fragile alive things. My arms folded against the wind, my mind folded against the other people’s bodies and my ears folded in away from the sounds of chit chat and I wondered how I could take the invitation I’d been offered to follow the movement of the grass. In an effort to get far away from myself, I followed a path of flattened grasses to their very edge. Standing with my waist against the nylon rope, I heard the mechanical high pitch of a building towering before me and my ears caught the tinnitus sound of harmonics. I wished it wasn’t there, and the traffic all around the site, it deafened me. An ambulance passed and I saw a body dying in my minds eye. And the ugly pipes pressed in all around me. So much effort to engineer these little grasses, curtailed by the rope and the marshaled edge of the land around. Starring beyond the wall outside and into the building I studied it and wanted to name it, to know what ugly stuff went into it, what went on there and the wind made my body cold. Then in the blur between, me standing on the grass, the rope and the concrete building beyond, I saw a sizable rat walk across in-between the ivy and the top of the wall, slowly under, across and inside the leaves. I thought I hated rats. I watched it recede into the undergrowth and then I did the same. Lying down, flattening myself, down and on the hay beneath me. The ground softly taking my weight, it is a relief, and I give my whole spine to it, and that is good. I feel quite alone and a peace creeps upon me. I close my eyes to the smell of the grass….breathing thing…… I open my eyes to a patch of blue flowers….breathing in….. I close my eyes to the touch of the wind… breathing thing…. I open my eyes and see vibrant leaves and silver tips all around me now. I close my eyes and feel the prick of nettles on the back of my hand and hear the glorious noise of weeds and grasses deep and green, moving amidst the wet. A sense of harmony now there in the place; concrete, rubbish, metal, earth, noise, animal, brick, rope, nettle and flowers. The sky widens and my eyes recede inside, inner eyelids close. 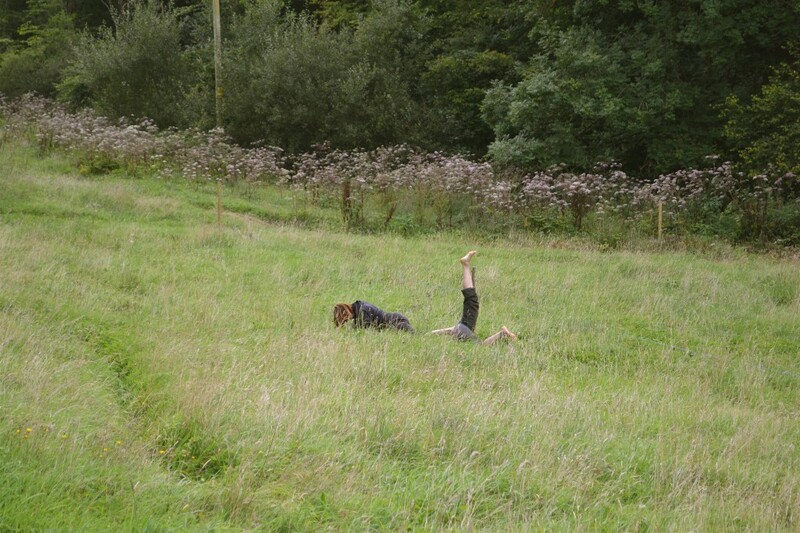 The thing is, I’d been interested in what I’d been asked to do – to follow the movement of the grass. Thoughts had been traveling through fast; pick up the swaying movement, pick up the dipping movement, the flattening down, the random swirling, the straight body stork and stem, the ears on top of the hay shaking, scattering seed, rough patches and dips. But what with the mutterings, the disorder, complexity and a choreographers mind – have a plan, a map then execute it, control the outputs. But in this place of weeds …. And with all the noise I couldn’t.. I didn’t want to. This rat then, using up the debris, a servant, inhabiting the moment. My back body against the ground. I take my feet up and the cool air surrounds me, the warm damp ground pressing into my head. The bit we call the fontanel; Sirsasana. Now I feel connected to the place, the affect of gravity realized. I feel my legs waving along with the plants and my trunk thicker resisting the movement of the wind. Now my mind is completely quiet, my body engrossed in the business of staying upright. I feel a kinship with the grass, and I feel the soles of my feet open out, tingling as though in tune with the rhythm of the field. And the space feels infinite and vast with no edges or boundaries. On coming down, I rested. I look back and imagine me there something like a crouching child or as if I were a stone or clod of earth. The cool damp ground giving me relief and I hear a flock of wild birds pass. I put on my shoes, socks, scarf and cardigan and returning back. I feel like looking up very very close and bend down burying my eyes in the meadow, and my hands too. I accidentally catch my hair on the way down and my fingers between the grasses attached to the ground. I see the roots and the brown undergrowth with more species laid buried inside and I feel as though I were touching the scalp of the earth through the fronds of grass leaving damp on my fingertips. The place is infinite and I am a part of it.